Children will enjoy two full version fun-filled programs in one collection.Treasure Cove is a colorful search for Sunken Treasure that combines underseascience with reading, math, and thinking skills. 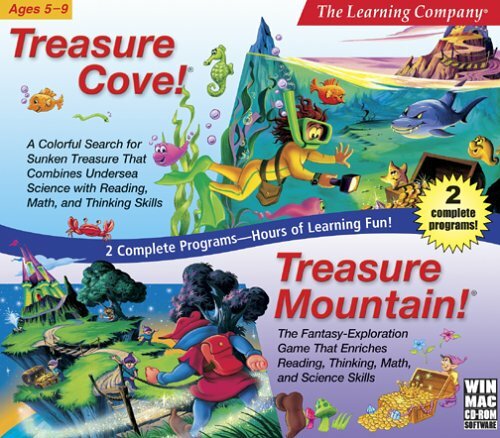 Treasure Mountain is afantasy exploration game that enriches reading, thinking, math, and scienceskills. From the Manufacturer What's better than a thrill-packed educational adventure? Two adventures, ofcourse! Discover virtually unlimited learning opportunities in _TreasureCove!_ and _Treasure Mountain!_ Enter a magical world where learning and excitement go hand in hand. Brimmingwith exotic environments, colorful characters, and brain-ticking challenges,this stimulating software duo is a fantastic educational tool.